There’s an app to keep track of almost everything now—calories, wines, beers, finances and now, oysters. Stay with us, it’s actually really useful. There’s an app to keep track of almost everything now—calories, wines, beers, finances and now, oysters. Stay with us, it’s actually really useful. Just think back to the last time you were faced with a list of oysters on a menu. There were the names of the oysters; maybe their place of origin and that was about it. Want to know more? Like, how they taste? You’ll have to go through a whole back and forth with the waiter. Or what about the last time you ate a really great oyster and wanted to remember the name of it so badly that you wrote it down on a scrap of napkin that you then promptly lost? Pearl, a new oyster-tracking app for iOS devices can help with all of that and more. The just-launched, free to download app features an illustrated, alphabetic oyster database with some of the most popular and most-served oyster varietals from Alpine Bay to Wiley Point. Each entry includes a picture of the oyster, where the oyster comes from, common flavor descriptors, size and a profile of the oyster’s brininess, body, cup depth and cultivation style. You can favorite the oysters you love and rate them by how much you liked them and their aphrodisiac aftereffects on sliding scales. The app also includes a guide to restaurants serving oysters in the area (as long as the area is in New York City, Boston, San Francisco or Chicago), arranged by distance from you at that moment. Each restaurant entry sports a list of the oysters currently available and, when appropriate, bivalve happy hour deals. 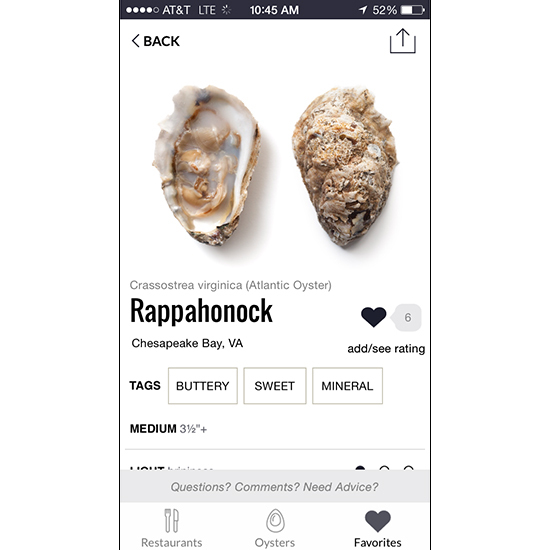 Try the app out while visiting one of F&W’s top oyster bars in the country.